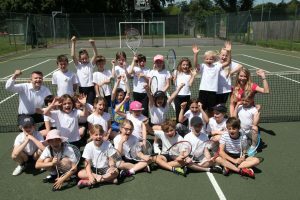 THE village of Holt came together at the end of last month for an epic 24-hour tennis marathon to raise money in memory of tennis enthusiast and friend to many, Steve Rowlands, who died last year of lymphoma. Organisers say that they are still counting the money that has been donated, but they are close to the target of £3,000, which will go to Lymphoma Action – the UK’s only charity dedicated to the disease. All sections of the community came together for the event, including year 3 of Holt Primary School and St Katherine’s Youth Group. Organisers Rupert Barton and Andrew Pepler from Holt Sports and Recreation Society said, “Bodies were put on the line, with some playing for up to six hours and through the night!